My back patio was in need of a makeover. 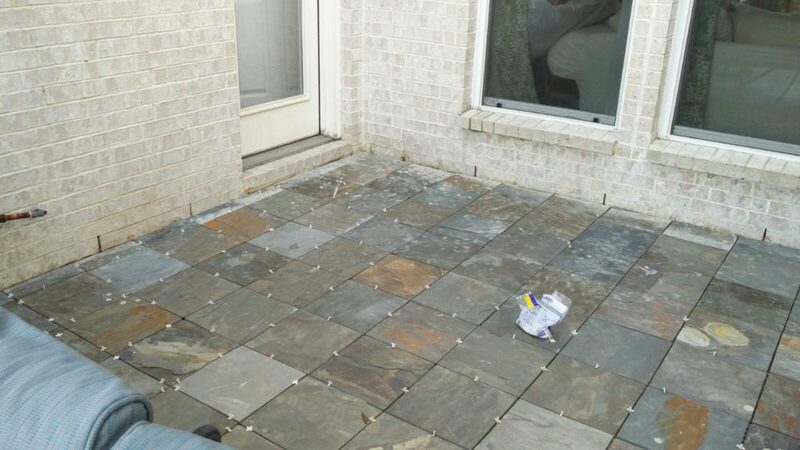 I had originally stained it but in high traffic areas, the color had worn off and the concrete had mildew stains. 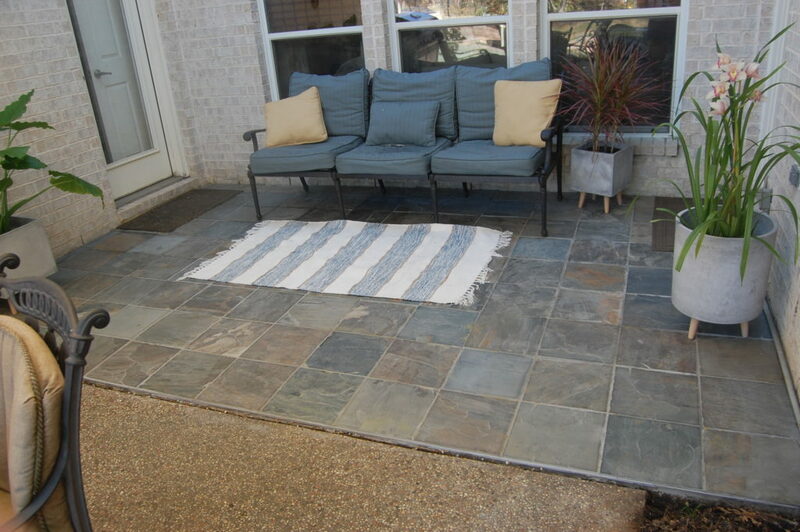 After a little research, I decided on adding slate tile to the patio. Slate tiles are very affordable @ 53 cents a tile and we already had a wet saw and all the tiling tools (trowels/sponge/spacers). You can calculate all your materials quantities needed online before you even go to the store – this will save time and the hassle of trying to find someone to help you. 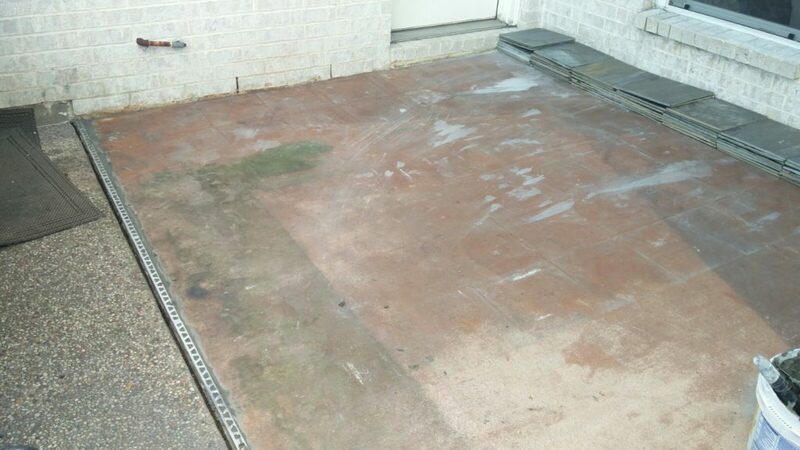 Start by cleaning your existing surface and let it dry. 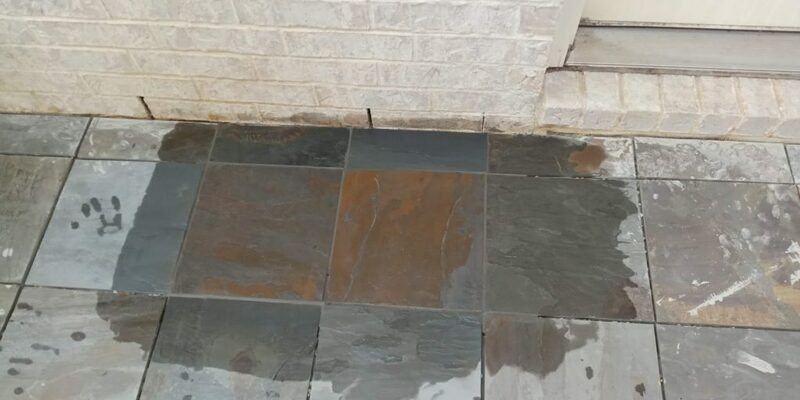 I used a schluter edge to protect the end of my tiles where the patio meets up with the pool decking. Make sure to wear old clothes and get a good night’s rest before you start….this is a workout! Now that you are ready to lay your tile. Mix the mortar to the manufacturer’s instructions. I used a trowel with a small and wide toothed edge, my preference because it gives you two options to get the needed grooves in your mortar. 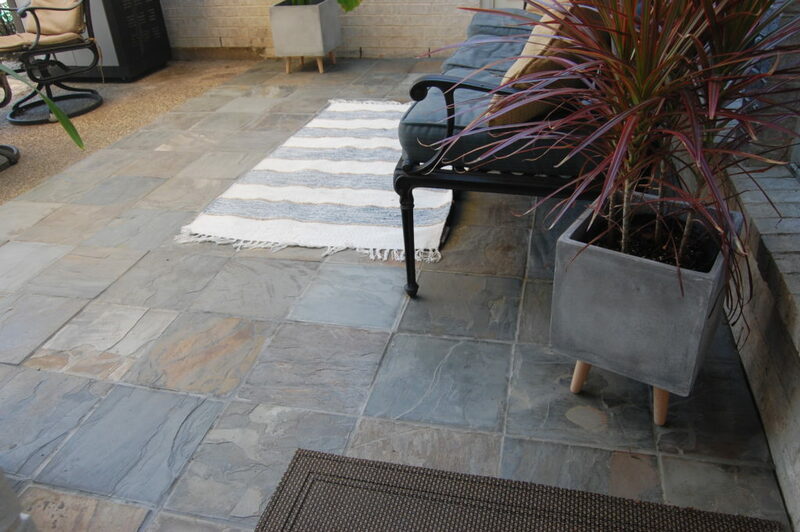 These grooves are important for getting the mortar even and will make your tiles last longer. Also, remember to add spacers to every side as you go – this will make your tiles exactly the same width apart. 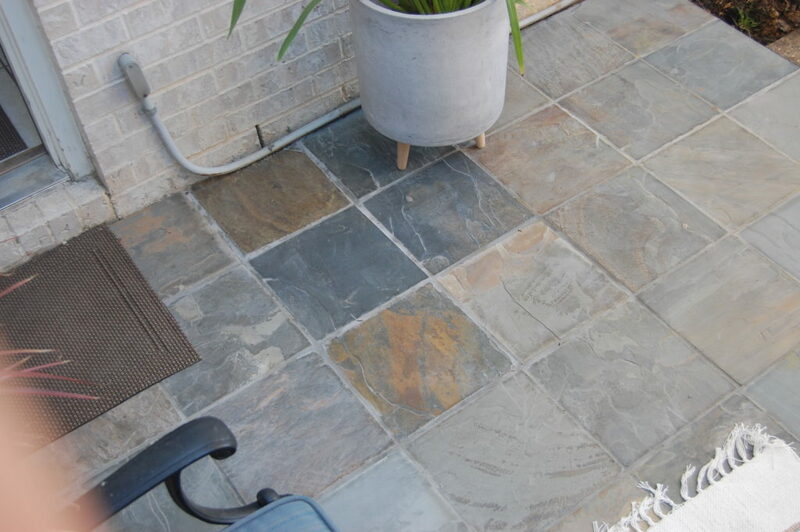 Slate tiles vary in thickness, so you will need to add additional mortar below the tiles that are thinner and less for the really thick ones. 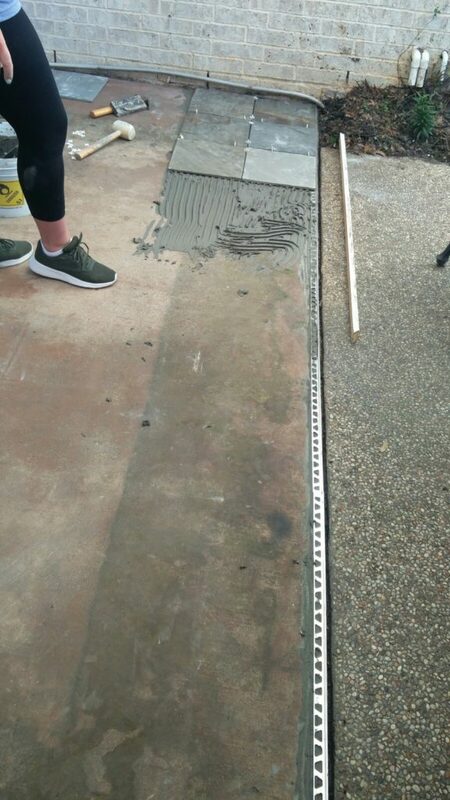 The schluter edge has spaces to install with the mortar. 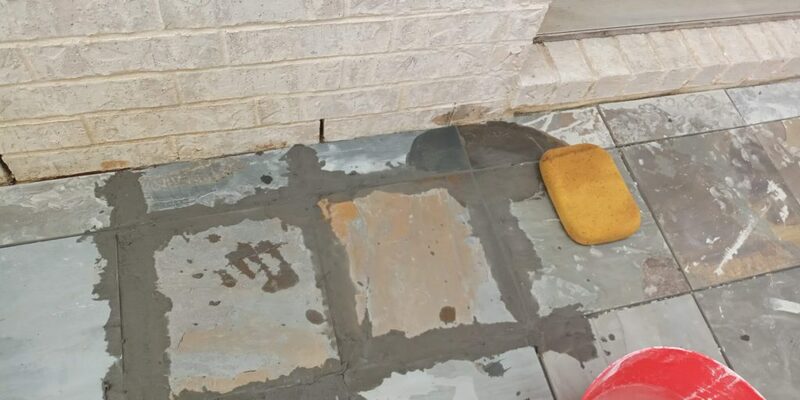 You don’t want a lot of extra mortar poking through the edges, just a quarter inch or so to make sure it’s solidly attached to the concrete floor. In the picture above, see how the schluter edge is installed and how the tile is placed against it but leaving a space for grout. On the edges, you will need to measure and then cut your tile to fit the opening. We started in the most high traffic side and moved towards the house. We wanted the cut edges to be up against the house. 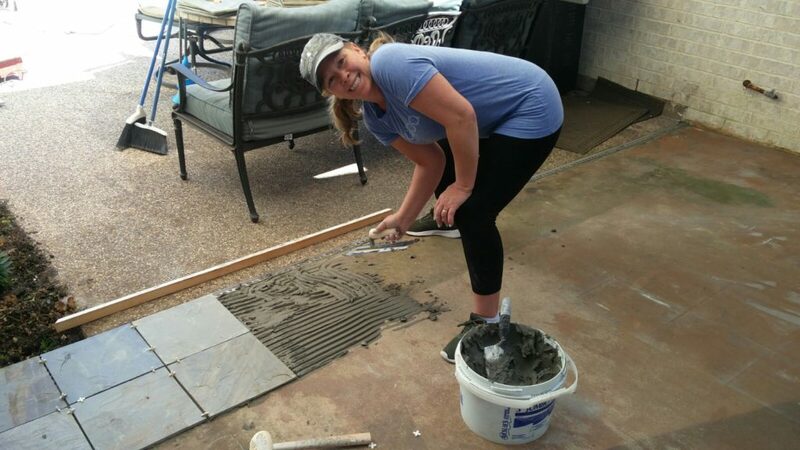 After you have installed all the tiles, you will want to wait at least 24 hours to grout. Don’t have a wet saw…or maybe you aren’t comfortable using one? Consider a manual tile cutter, I started tiling with it – see kitchen backsplash in lakehouse kitchen project. 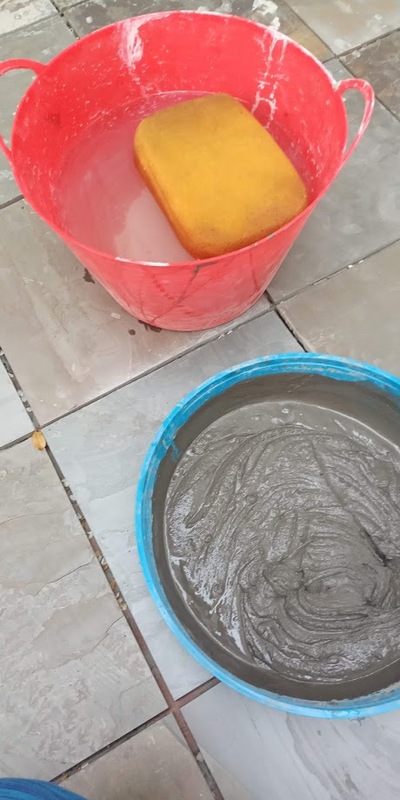 When you go to grout, make sure you are ready with a clean bucket of water and sponge, as well as your grout (premixed or mixed to the manufacturers specs). I chose a medium grey color for grout. Work in small sections so the grout is easy to remove and don’t mix too much grout, because it will dry out if you work slow. I used a small putty knife to apply the grout, pushing it into all the spaces….doing about 9 tiles before I washed it off. To remove the excess grout, squeeze out most of the water in the sponge and lightly rub the entire surface. Rinse sponge and repeat, leaving less and less water in the sponge. I waited about 24 hours after grouting to clean the tiles really well…using my little steam cleaner.